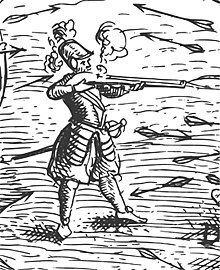 Detail from "Deffaite des Yroquois au Lac de Champlain," frae Champlain's Voyages (1613). This sel-portrait is the anerly survivin contemporary likness o the explorer. "The Faither O New Fraunce"
Samuel de Champlain (French: [samɥɛl də ʃɑ̃plɛ̃] born Samuel Champlain; on or afore August 13, 1574[Note 2][Note 1] – December 25, 1635), "The Faither o New Fraunce", wis a French navigator, cairtografer, draftsman, sodger, explorer, geografer, ethnologist, diplomat, an chronicler. He foondit New Fraunce an Quebec Ceety on Julie 3, 1608. He is important tae Canadian history acause he made the first accurate cairt o the coast an he helped establish the settlements. ↑ The bapteesm act daes nae conteen information aboot the age o Samuel, naither his birth date or his place o birth. Fischer, David Hackett (2008). [Samuel de Champlain at Google Books Champlain's Dream] Check |url= value (help). Simon and Schuster. ISBN 978-1-4165-9332-4. This page wis last eeditit on 23 Februar 2018, at 20:04.